I was going to write about something else, I have done research for a Middle Eastern topic, as some readers know I love the Middle East and am dedicated to write about sides of this region that usually are unnoticed in the Western media. But then there was the terror attack in Turkey. 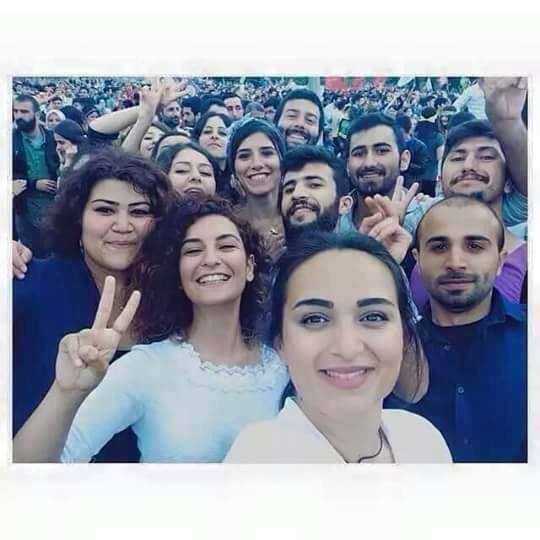 This photo supposedly shows activists from the Socialist Youth Association Federation, snapping a group selfie before the bomb blast in Suruc. Turkey, the country that has sailed up from poverty and created a large middle class and that hosts a vivid civil society – now pulled back by the murder machine of we-know-who. Before that, it was the Eid blasts all over. On a holiday that is sacred to many. Before that, there was Tunisia, a country where I was supposed to go visit friends in a few days time, in Tunis and Sousse, only having to cancel it when Sweden’s Ministry of Foreign Affairs changed their travel recommendation. Before that there was the Charleston massacre. I think we will remember this time as a dark turning point in history, when dark powers started to outweigh the good ones, and terrorism conquered co-existence. May God help us, if he exists. I believe that it is a ‘dark turning point’ because I too, feel the same way and my poetry reflects that. It is my opinion that the dark powers reign, unchecked and that if there is indeed, God, then we could use some help right about now! Thank you for posting this. It completely resonates with me. Why is it ‘…if He exists…’ and not ‘S/he exists’ ? could that be part of the problem ? Dear JC, It is very understandable that you are feeling depressed by the terrible actions happening around our poor old world, but you mustn’t lose your inspiration, it is too valuable for continuing the good work you are doing. Actually, I don’t believe that we are at a turning point, except perhaps more people are beginning to realize that we must work together if we are to survive as a species. In some ways, the current scourge of ISIS is but an ignorant reaction to the real evil negatively affecting our “civilization.” The unfettered greed of many persons in the large, multinational corporations and the governments they attempt to control may be the real cause of the current terrible stress on civil behavior. Yet, in all the havoc, there are still many sources of hope if one stops to think about it. Of course, it is more difficult to see the good things that are happening, due to the fact that the “news” outlets prefer to play up the ugly stories for some reason. That does not mean civility is not there, so take heart and please continue your chronicling the good actions of people you know in the Middle East. JC, I appreciate the news and stories you share. Your work does make a positive difference. The dark forces win when hope is extinguished. These days, I write and try to help my family and neighbors, and I garden. It’s nothing important, but the neighbors in the high rise across the street tell me my garden makes them happy and gives them hope. I wish I could stop war and suffering, but like the starfish thrower, I breathe love into what I can do. (https://en.wikipedia.org/wiki/The_Star_Thrower) I have sensed the same spirit in your work in the past, and even in this post with your deep and poignant grieving over senseless war and death,.